If you want to add a bit of sparkle to your party, the Party Warehouse stocks a fantastic range of sparkler candles to help you celebrate in style! Not only are they perfectly safe to use indoors within your home or party venue, but like a miniature fireworks display, these gorgeous sparkler candles will create a spectacular fountain of light to provide entertainment and fun at any event. Sparkler candles make a brilliant centrepiece for your party table, creating a truly magical, show stopping moment when you dim the lights and bring out the cake. Once lit, our sparkler candles will erupt into a colourful and exciting display which is guaranteed to impress your guests! 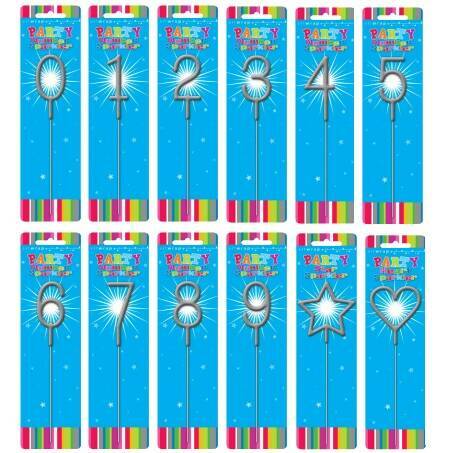 If you’re throwing a birthday party we have numbered sparkler candles you can combine to celebrate any age, in blue, pink, gold and silver – no birthday party will be complete without a little light display to get the guests talking! We also have some truly impressive fountain sparkler candles to really wow your friends and family, and you can choose from stylish gold, black and pink. Once lit, these colourful fountain sparkler candles throw out a shower of light to brighten any occasion - they will make an ideal decoration to top any birthday cake or festive pudding! So whether it’s a birthday party, an anniversary get together or to top the dessert at Christmas, the Party Warehouse’s sparkler candles will light up any celebration and add a touch of glitter to the event! Includes Pack of 2 Silver Fountain Candles. Includes Pack of 3 Fountain Candles.